The possible projectors types depends on the installed plug-ins. • Digital cinema: this category contains all supported digital cinema projectors. • Mid venue: this category contains all supported projectors from the CLM and SLM series. • Large venue: this category contains all supported projectors from the FLM series. • XLarge venue: this category contains all supported projectors from the XLM series. 2. Move the cursor to the right and select the desired category. 3. Move the cursor again to right and select the desired projector. 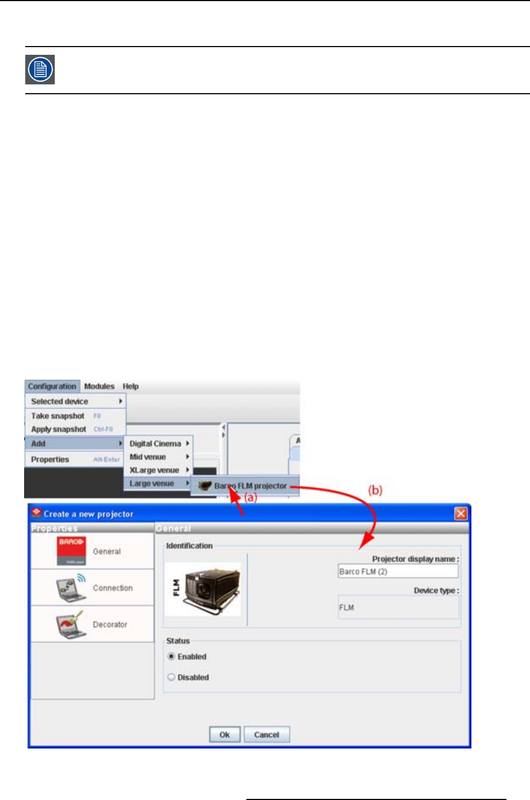 The Create projector dialog box opens with the selected device type pictograph at the right side (b). projector decorator for the conﬁguration preview.